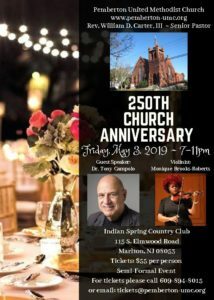 Join us for the 250th Church Anniversary will be on Friday, May 3, 2019, at Indian Springs Country Club, 115 South Elmwood Road, Marlton, NJ from 7pm to 11pm. The tickets are $55 per person and the children’s tickets will be $20 per child. Our entertainment for the evening will be a classical violinist, Monique Brooks-Roberts, and we will hear an inspirational message from Dr. Tony Compolo, who is a world renown motivational speaker and preacher. We will also have a DJ for this event. We will have a 250th Souvenir Journal so individuals and businesses can purchase a whole page, half page, quarter page, or a put a business card in the booklet. Also, we are selling Custom Brass Commemorative Ornaments. For more information please email us at events@pemberton-umc.org or call us at 609-894-8015.